Of course, if you're reading this, you know who Alfred Hitchcock is. If you somehow do not and consider yourself a fan of classic cinema --- Hollywood or otherwise --- you need to rectify that as soon as possible. 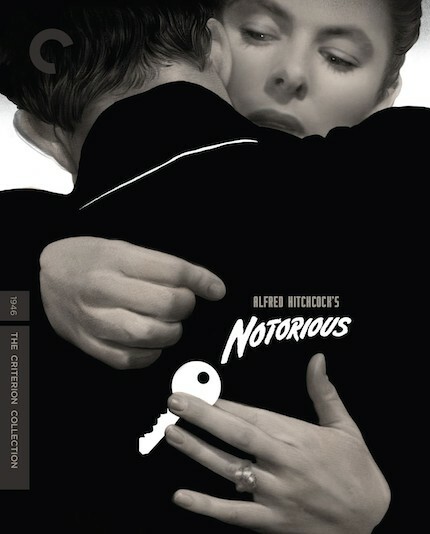 One of Criterion Collection's latest releases for the home video market is the Blu-ray for Hitchcock's taut spy thriller and romance, Notorious. I have to say that if you're a student of film, this release alone is like an affordable, minature film school in one beautiful silver disc. To start, I consider Notorious to be a nearly perfect film, with everyone involved performing at the top of their game. The script was written by legendary Hollywood and Broadway scribe Ben Hecht, whom you'll learn more about in the included documentary and bonus features. Hecht was the author of many of the three-act screenplay constructs and plot devices still used today, as well as the recipient of the first Academy Award for writing. He was consisently nominated for several other awards, including the Oscar for Best Original Screenplay for Notorious, as well. The leads are old school legends. Ingmar Bergman stars as Alicia, a Miami party girl who's father was just sentenced to war crimes due to his Nazi past. Cary Grant also stars as Devlin, a government agent sent to entice Alicia into working on a very sensitive case with him in Rio do Janeiro. A friend and co-conspirator of her father's is there with a group of other Nazis, and they're suspected of some nerfarious doings; it's up to Devlin and Alicia to find out exactly what and to foil their plans. Alicia accepts; however, she and Devlin fall in love along the way, with a still-effective, quite affectionate kissing and nuzzling scene that enraptures. Back then, the scene was Hitchcock's way of giving the proverbial middle finger to the Hays Production Code. You see, kisses were not allowed to last longer than two seconds! This directive was ingeniously skirted around and arguably made the tension between the leads that much hotter. Conflict arises when the agents want to put Alicia to use as a honeypot. Being in love, it's clear that she doesn't want to do it, but Devlin makes no impediments toward the mission and urges her to make her own decision. Of course, he then judges her harshly for serving her country, and the world, with callous remarks and behavior. That's about all I'll reveal about the plot; watch the rest of it for yourself to watch a great, satisfying story unfold. The innovative camera work on display here by Hitchcock and his director of photography, Ted Tetzlaff (in his swan song) is riveting to watch. There are classic noir movements that tilt as Bergman's drunken Alicia watches Grant's Devlin as she awakes from last night's party with a headache that are just mesmerizing. And there's a whole bonus feature devoted to a certain shot; the crew had to construct a special build for the this technically difficult crane shot, and it's even more impressive to see when it's explained that the cameras worked differently in parallax than they do today. Like I said earlier, this release is basically a form of film school, with not just a film from a master, but the features with great analysis into scenes and the visual storytelling techniques used, as well as an informative documentary on the background of the political climate and what was going on in the world at the time when the film was released in 1946, just post-World War II. It's all utterly fascinating. The picture only has minor flickering, mostly in the beginning of the film, and the audio is superb. The blacks are rich, and the tones lustrous. This is really evocative of the "silver screen" and the 4K digital restoration is lovely. Now look upon ye special features, my friends, and weep! Want it? Need it? Can't live without it? Head on over to Criterion's site to learn more about this fantastic release here.